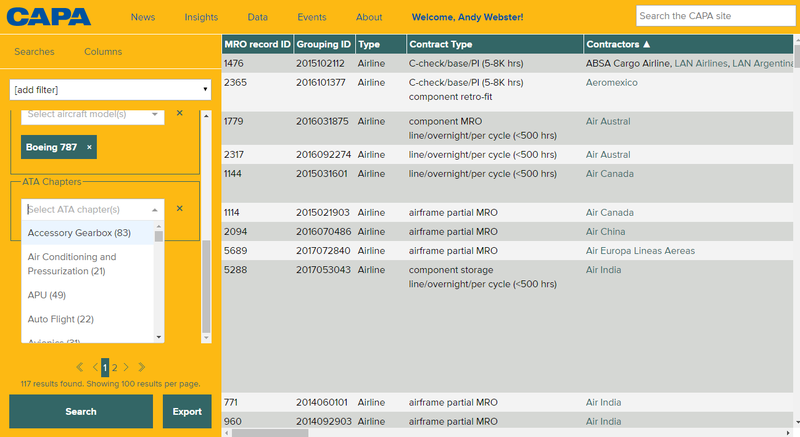 CAPA - Centre for Aviation is pleased to present our new MRO contracts and capabilities live online database - the CAPA MRO Matrix. This will be presented in full for the first time at MRO Americas, 10/12-Apr-2018. For those familiar with similar systems, it has every functionality for third party MRO market intelligence, but also has numerous positive surprises that are unique to the CAPA Matrix. The MRO Matrix acts as a repository of well-known and little-known contracts between airlines/lessors and providers as well as subcontracts between MRO companies themselves - making it a very handy business development and competitor analysis tool. Clearly, every contract proves a capability for the provider, but CAPA also collects separate updates on capabilities and, taken together, these are presented in the raw data or in a much more user friendly way than other systems. More user-friendly interface with export capability and seamless integration online with CAPA's whole range of data products (eg live links to CAPA's Fleet Database). CAPA's MRO Lead, Andy Webster, says “Our aim is to differentiate from earlier MRO databases on the market by delivering information faster, near to real-time and across all ATA chapters of component deals. Since beginning the development project nearly five years ago, CAPA has painstakingly gathered data and incoming information before refining each category down to best represent it in its entirety. This uses the current terminology of the market and reflects latest trends. For example, MRO software, composites and 3D-printing types of contract are covered. In developing the MRO Matrix, an early decision was made to buck the trend for data suppliers to either ignore or cherry-pick component coverage. 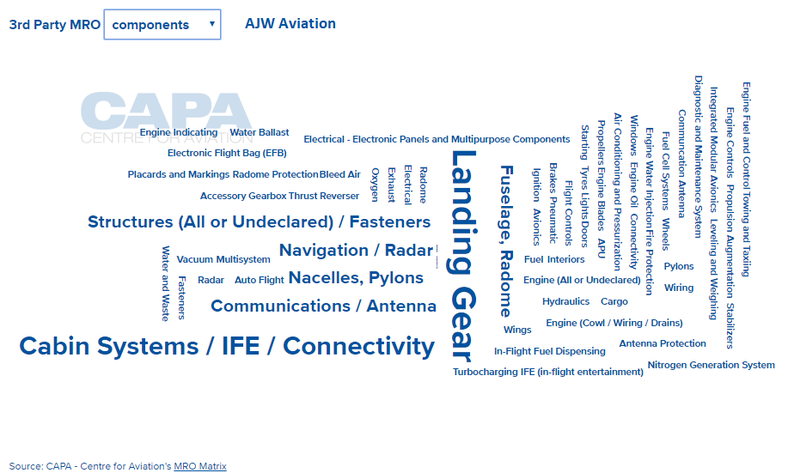 Instead, the MRO Matrix covers every area for fixed wing aircraft and uses the familiar ATA-chapter headings. 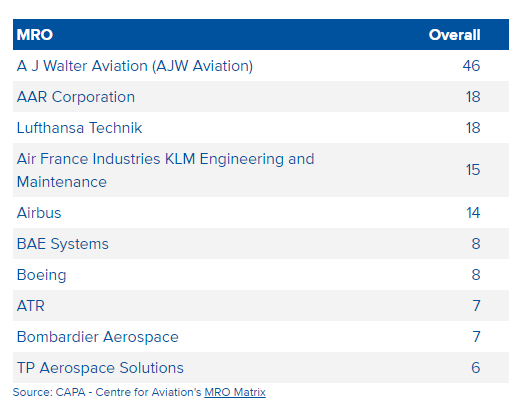 Innovating again, the CAPA MRO Matrix tracks over 6,000 contracts (and growing daily), across 53 types types of contract activities – many more than any other database. These are described in the glossary and contribute to CAPA’s preferred approach of reflecting the whole of the market, not just letter-checks. Among most data providers and industry watchers, the conventional wisdom is that components aren’t important, and the OEMs have the market sewn up. With these attitudes rife, decisions are made to ignore sections of the marketplace, rendering it difficult to build and use tools that encompass components and OEM company activities fully. CAPA has monitored the market for nearly five years before refining our findings down to a dataset. A review of the real situation delivers the true scale of announced contracts over the past five years. The fact that it is completely live and online means that the MRO Matrix always has the latest data without any tedious update-cycle – in common with all of CAPA's data and news services. Producing 400-500 news stories every working day of the year gives us a unique capability to update all details in real time, as with the CAPA Fleet Database. The MRO Matrix also provides a truly seamless interaction of the data points and company names. This measure of signed contracts shows component-related contracts form a surprisingly large proportion of the marketplace, especially so if the ancillary services are factored in, not just component repair. These include spares provision, logistics, lease/loan and so on. Moreover, component-related services are almost exclusively outsourced among operators who still do the majority of their own MRO work. 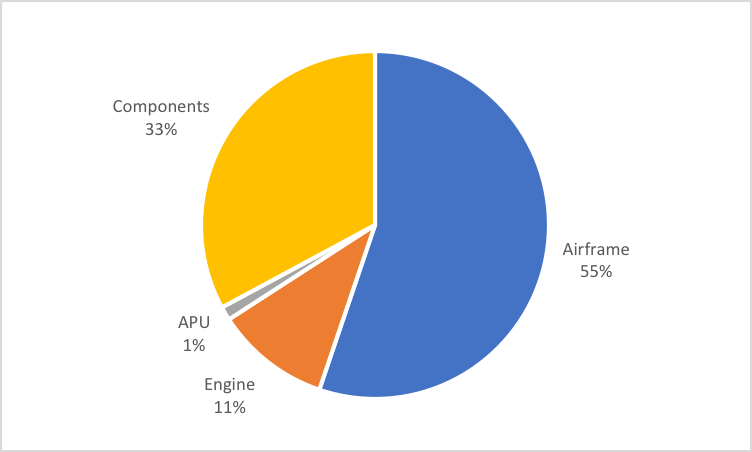 Most data services only monitor a small sub-set of components, but if all ATA-chapters are considered, a much better picture emerges of market activities and how MROs differ. While landing gear (ATA-32) and cabin systems clearly dominate the activity of both providers, avionics and navigation feature more prominently in UTC’s offering. This is explained by UTC’s various business units and OEM role, plus the tendency for AJW to provide ‘all components’ services to their customers in Power-by-the-Hour agreements – thereby distributing their respective ATA-chapters more evenly. Such an analysis of competitors will help to provide context for evaluating activities – or act as a quick-reference before meetings and calls. 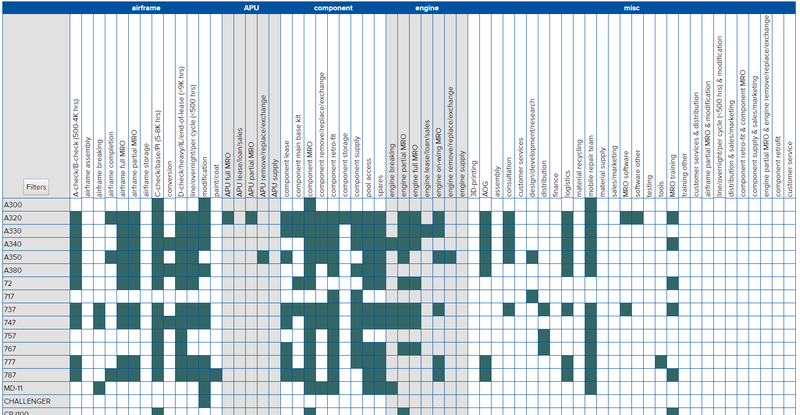 There is also a large variance in the geographic provision of component MRO types. In component retrofit, there is a good spread of activity across the globe with Europe and North America dominating equally; whereas a look at pool access contracts (where the operator wishes to guarantee availability for rotable parts from a provider’s ‘pool’) shows it being more important to the European market and Southeast Asia and North America in joint second place. For the first time, such visuals provide a useful awareness of the market from a meta perspective. Do the big OEM suppliers really have the third party market largely to themselves? Contrary to widely-held belief, OEMs account for only two-fifths of the whole component-related market, leaving a lot of business to independent component service providers. 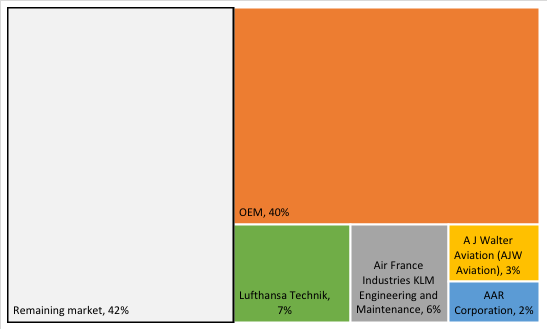 With only a further quarter of the market taken by the ‘big 4’ (AFIKLM, AJW, LHT and AAR), there leaves over a third taken by independent or airline-owned MRO companies. Such a spread is somewhat surprising and warrants further investigation. A noteworthy tangent to the OEM/independent discussion and with the increase in big-ticket merger and acquisition activity, it’s interesting to investigate what has happened to AerData and Boeing’s combined market share for MRO software contract wins over the last few years. Prior to the 2014 merger, combined they were in fourth place in 2014 and lower the year after, but since then have stormed in to second place on CAPA’s unique leader board, out-selling all competitors. It seems that after a slow start the might of the Boeing sales and marketing teams have come good and produced a strong performance for the AerData branded MRO software. Looking at the market in a new way with fresh tools can offer some important insights, particularly where it is possible to look at broad strokes simultaneously with individual performance. At CAPA, we call this "gaining an unfair advantage" (borrowed from one of our beta-testing members’ compliments) and are excited to welcome our members to the MRO Matrix. 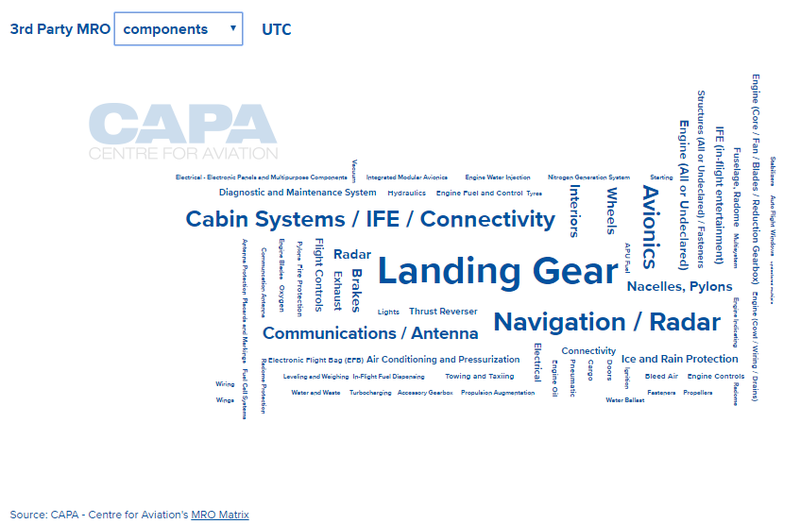 The MRO Matrix builds on the extensive CAPA Fleets database, which offers hours/cycles and ownership, histories, and more of worldwide commercial aircraft fleet and now we offer API connectivity for all data aspects. This is designed to help power CRMs, Tableau integration, analytics/graphing, intranet and other system applications - "everything we gather is now available to get ‘piped’ to you via API." Established for nearly 30 years, CAPA has established itself as the world's leading provider of aviation news and analysis. Increasingly over the past few years, we have expanded our data offerings, all of them on highly flexible and user friendly platforms. CAPA’s philosophy toward data products reflects our members’ desire to customise their output and take only what they want to use. This means that we allow customised date-range searching, rather than providing limited pre-determined points in time, for example. And finally, all-new to the market is our OEM supply data, built over the same time and within the same structure as MRO. So as well as tracking tier-one and -two suppliers to aviation platforms, those companies that cross over into aftermarket services can be properly reflected. We’re just beginning to demonstrate the power of this data for members and look forward to seeing how the very first eyes on it will inform their growth and strategies.